Note: In order to do this well, you should wash your hair the night before — second-day hair is always better when you're doing any kind of hair-do. Okay, ready? Heat up your curlers. First, decide which side you want to part your hair on (and remember, it'll look like the mirror image to other people), then part it. Spritz some gentle hold hairspray into the air and walk through it quickly. This is just to give your head a little bit of traction, not to set it. Ignore the tiniest rollers (they'll make too tight a curl). Start curling on the "heavier" side of the head (the one on top of your head, moving away from the part). Take roughly a 1" strand of hair and roll it around the curler; pin or clip. Once half way to your ear, roll the hair on the lighter side to your ear. The "bottom layer, both side and back, roll with the large rollers. Remember to curl hair over and under, otherwise you'll end up with a flip. Wait about 20-30 mins while rollers cool. You can begin your makeup while this takes place. When the rollers are cool, gently unroll them one by one without too much pulling the hair straight — your curls are still vulnerable. Next, using a comb, make a wave (size depends on your hair and how large you want it) on the crest of your face. 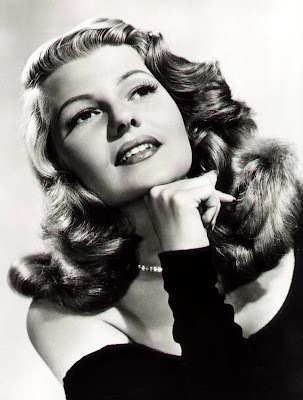 Bobby pin it back (check out Rita Hayworth). Light spray near the hairline. Try not to touch the outermost strand while you do the next steps. Shorter or lighter hair: run brush gently through. If ends aren't curling under, use curling iron to add curl to ends. Also a good idea if ends are a bit frizzy. Longer, heavier hair: as you unroll each strand, roll them into "pin curls" and pin them on your head for another 10 mins or so. Then, gently brush through. Use curling iron to curl hair under and to add curl to strands that may be too straight. With your hand, hold down the hair while you remove the bobby pin holding down your bang. Comb through it gently, all the while holding your wave in place with your hand. Once you have your hair exactly as you want it, use the "Instant Freeze" spray on your top wave (bang), but not too much— it will go as hard as a rock and you won't want to touch it after this. Spray the gentle hold hairspray onto a brush and gently brush through to tame flyaways. Next, mist the air with the gentle hold and walk through. Finally, mist shine spray into air copiously, and walk through. This hair should last you around 3-5 hrs, depending on how long and thick your hair is, the humidity, the wind, and how much activity you undertake. Most Important: Never try this for the first time the night that you need to look glamorous — you'll need to practice making your 1940's glam hair at least once or twice to make sure you can replicate the results. Rita Hayworth photo from my own collection. great advice. i will definately try this. i have also used the Audrey Hepburn step by step guide. thank you for the assistance. Fabulous tips; I'll bear them in mind! Thanks honey! If you want to create the 'finger wave' effect, simply roll the curlers every other way- one up, one down, one up one down, all the way down both sides of the head. I would suggest smaller rollers though if you want the 20s 30s wave. thank you so much! i have been looking for a how-to for Old Hollywood Glamour Hairstyles, this is exactly what I needed! Awesome! This is almost exactly what my hair does naturally :) I want to emulate Old Hollywood in my everyday style, so this won't be hard to do. Thanks for the picture! I'll be on your blog frequently for more tips. Pretty helpful data, lots of thanks for your post. Quite useful information, thanks for your post. Quite worthwhile information, thanks for your post. Hi! I would like to open beauty salon. Does anybody have an experience in this business? There are too many options in different salon equipment. Could anybody give me an advise? What store is more reliable to buy Electric esthetician table and Hydraulic esthetician table. I'm choosing between Advance-Esthetic and Spa&Equipment websites.